I confess. I love fishballs. When they come fresh and springy, I can take about a dozen in one go. So, what’s this obsession with fishballs then? One thing is – it is cheap. I can get them for 10 cents each from the wet market. It is quite healthy though it may be processed fish meat. And it is easy to cook. You can fry them or use them in soups. When using fishballs in soups, it can either be as an accompaniment or as the highlight of the soup itself. This recipe highlights the fishballs. I use chinese mustard greens (choy sum) to make this dish one step healthier – what with the fibres and nutrients from the vegetables. For the soup base, I use ikan bilis stock prepared fresh and not the instant granules. Ikan bilis stock is easy to prepare and you can even cool it and store them in the freezer for future use. Handy especially when you want to whip up a quick soup. Hahaha…talking about fishballs too! I prefer Malaysia/Singapore fishballs to those in Taiwan. 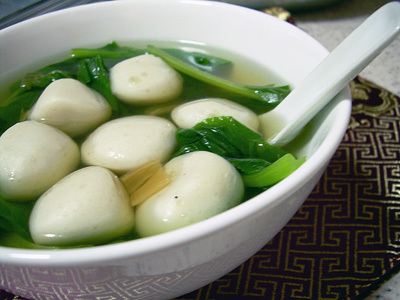 Those in Taiwan – the fishballs’ texture is like sotong ball! Delicious & such a comfort food. My Mom used to cook her fishball soup exactly like yours, yums! Whenever I go back to Singapore to visit the family, the first thing I eat is the fishball soup & youcharkueh at the hawker center. I loooooove fish balls, too. What’s not to love, right? The best fish balls are Malaysian fish balls, I reckon. Other country’s fish balls are all powdery, after you cook them, they expand 2X…scary. And the fish balls in the wet markets are simply irrestible…so many different selections, shapes, colors, and varieties. Everytime I go home to Penang, I would hit the wet market in the morning and sapu all kinds of fishballs and cook up a pot of soup every day!!! Hi, mind sharing how to make the fresh ikan bilis stock? Sounds interesting. Thanks! Jonah : Boil 700 ml water with a handful of ikan bilis for 30 minutes. Strain and remove ikan bilis. You can use lesser amount of water if you want. There is no hard and fast rule to making / boiling fresh ikan bilis stock. It’s a favourite comfort food of ours too! I love fishballs! I used to eat them with almost everything. Have you ever tried curry fishballs? That is probably one of my favorites. But I will definitely try your Fish Ball Vegetable Soup – its sounds like it wouldn’t take too long to cook. I love your blog. You include so many different recipes and different dishes, I can’t wait to try them out! Did you come up with this recipe yourself? What is your favorite Asian dish? or Asian recipe to cook? Why did you decide to start this blog?